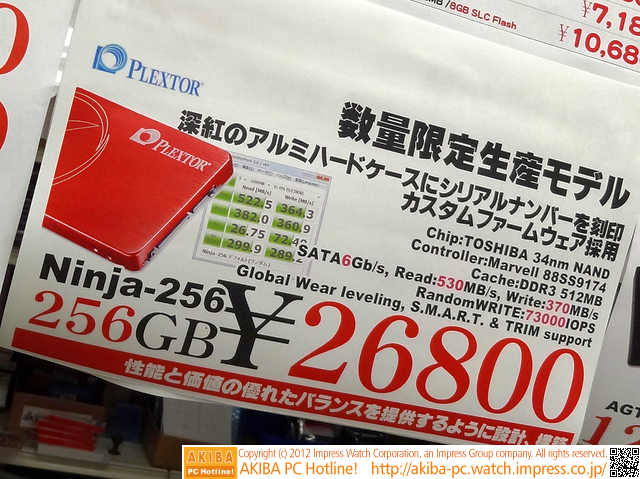 Plextor has released the Ninja-256 SSD in Japan. The drive has a special red, aluminum case with a shuriken (throwing star) on it and is being sold in limited quantities. Inside, the drive has a Marvell 88SS9174 controller with SATA 6Gb/s interface, 512MB DDR3 cache and Toshiba 32nm NAND flash. The end result is 530 MB/s sequential read and 370 MB/s sequential write speeds and 73,000 random write IOPS. Expect to pay a hefty sum if you want one of these. According to AKIBA PC Hotline (http://akiba-pc.watch.impress.co.jp/hot ... extor.html) the Ninja-256 is going for 26800 Yen ($340US) in Japan.